The headboard is the focus of your bedroom, and any defects are immediately noticeable -- and detract from its value. 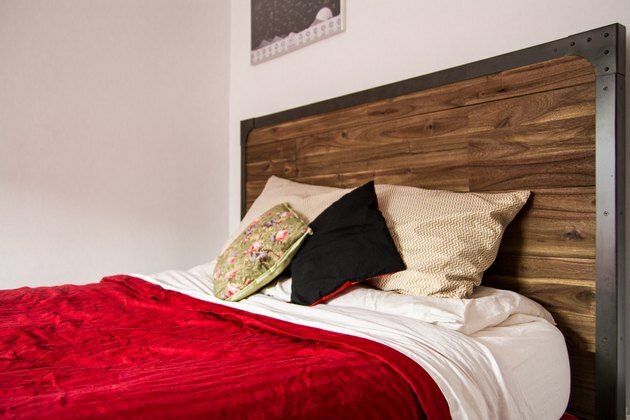 A more important consideration is that a headboard supports whoever is sleeping in the bed, and structural defects can affect its stability and make the bed wobbly. Common problems affecting headboards that you can fix yourself include cracks, joints that are separating, and, in some cases, loose mounting pins. A headboard, like a chair, is subject to sideways stresses that can weaken its joints. To repair loose joints, you need to remove the headboard from the bed and take it into your workshop. Tap the loose joints apart, using a rubber or wooden mallet, and scrape old glue off the tenons -- the male parts of the joints -- using a utility knife. When you re-glue the joints with carpenter's glue, be sure to clamp them securely with bar clamps for at least 8 hours to ensure the glue sets strongly and the joints are permanent. Headboards must have some way to hold the bed rails, and it's common for manufacturers to install one or two mounting pins on each leg. The mounting plate on the rail fits into the slot and hooks onto the bullets. If these are loose, or the wood around them cracked, the bed wobbles and feels unstable, and the wobbling exacerbates the problem until the headboard is unusable. You can repair loose bullets yourself, as long as you do the job before they have become too loose to support the bed or the wood isn't damaged beyond repair. The reason mounting pins become loose and unstable is that the wood holding them has cracked, and that's something you can fix with clamps and glue. Carpenter's glue usually makes a reliable repair, but because the repair has to support weight, using two-part epoxy provides extra insurance. Spread it generously in the cracks, using a toothpick or, if the cracks are deep, a syringe; then clamp the crack closed and leave it overnight. Epoxy repairs are usually stronger than wood. After removing the clamps, you'll probably want to sand and apply some stain and clear finish to hide the repair. If your headboard is made from laminated planks, it may have developed a crack, and that type of crack is usually repairable with clamps and glue. Cracks or breaks in spindles or in the rails that hold the spindles aren't always repairable, because these parts must withstand shear forces that glue joints can't withstand. The solution is usually to get a replacement for the broken part. You can make it yourself if you're handy with a table saw and lathe, but, if not, bring the damaged part to a woodworking shop and have a new piece fashioned by a pro.